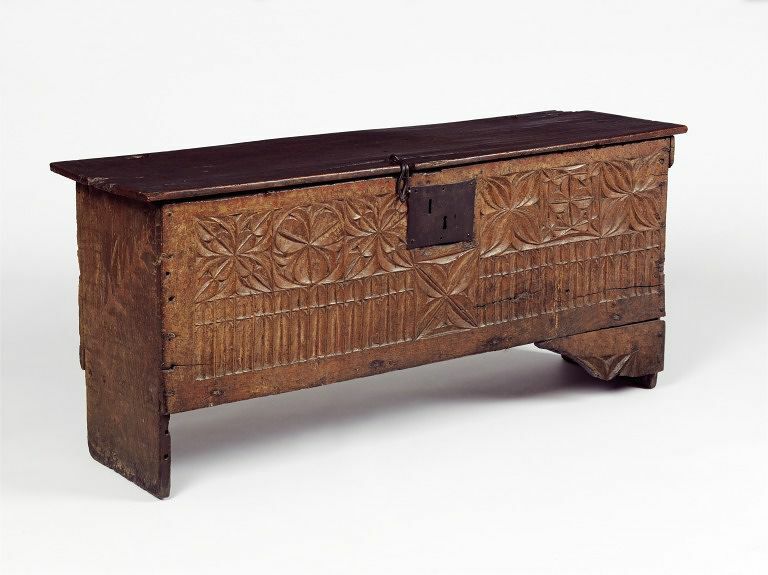 Chests were the earliest form of furniture used for storage and could easily be carried from place to place. They were used for storing clothes, linen, documents or money and often had locks for security, as in this case. This example is East Anglian, and was purchased by a former owner at Bury St Edmunds. It is constructed of six boards, one for each of the sides, bottom and top.The lid and back are of elm and not original. On loan to Woolsthorpe Manor (National Trust). Chest constructed of six boards, the front, which has traces of the original red paint, is carved with two bands of ornament, the upper of quatrefoils and trefoils, the lower of a row of narrow arches. Below the front is a portion of a carved spandrel at one side; the corresponding spandrel at the other side is missing. Boarded oak chest with geometrical panels of ornament on the front, on raised feet. With one spandrel attached to the front right foot (with loss). The back and lid (elm) replaced. With an iron lock (replacement) and iron lid hasp to match, with the square blank area originally intended for a lock visible underneath. Originally fitted with a till (proper right). With reinforcing oak strips nailed to the PL foot (inside face) and across the top of the PL end (to counter warp). The front has a wider left hand vertical border than the right side (58 vs 13mm), while the lock plate is centred at 55cm from the left end, suggesting that either the carver mis-measured his work, or that the right end has been cut down. Note – although there are 3 empty holes where the front is nailed to the left end (possibly evidence of refixing), the nail and peg fixings appear to be original to the chest, and both ends contemporary. Its possible that the front was cut down (by 45mm) and reused to make a slightly smaller chest, but perhaps mis-measurement by the carver, or less good timber at the right end (that needed to be cut back) of the front is a more likely explanation. The front nailed and pegged (from the front) into the ends and floor. With traces of reddish and white pigments over the front, and a large fern motif on the left end. The back panel with clear pit-saw marks. Bought on the Museum's behalf by Mrs Rees-Mogg, Clifford Manor, Stratford Upon Avon, from Frank Jennings (12 Holland Street, W.8), along with two chest fronts (W.429-1922 and W.430-1922). H.Clifford Smith noted that 'it still retains traces of its orginal red colouring.' They were delivered to the Museum from Walberswick, Suffolk, and the acquisition file records that it had been purchased by a former owner in Bury St Edmonds. A pencil sketch elevation (author unknown) is with the RP 22/7208. On loan to Woolsthorpe Manor, Lincolnshire (National Trust), and displayed in the upstairs bedchamber, 2014. 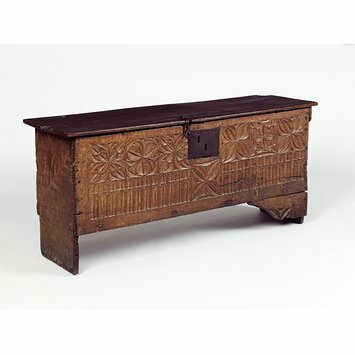 Comparable chests: V&A W.98-1922 height 53.3cm (without V shaped feet), and W.69-1916 height 67.5cm), Mary Rose (c.1540), elm without carving but with simple spandrels; Burrell 14/348; DEF Chests entry fig. 15, 23 all tend to a similar height, and usually feature V shape cut-outs in the feet (missing on this chest) suggesting that if this chest has been reduced in height it is by a matter of no more than 5-6cm. Charles Tracy, English Medieval Furniture and Woodwork (London, 1988), cat. no.302. East Anglian, purchased by a former owner at Bury St Edmund’s'. H. Clifford Smith, Catalogue of English Furniture and Woodwork Voll II – Late Tudor and Ealy Stuart (London 1929), plate 45, no. 312. ‘CHEST, constructed of six boards; the front, which has traces of the original red paint, is carved with two bands of ornament, the upper composed of quatrefoils and trefoils, and the lower of a row of narrow arches of late perpendicular character; below the front is a portion of a carved spandrel (the corresponding spandrel at the other end is missing). The iron lock plate has been added. The lid and back, which are of elm, date probably from the 18th century. East Anglia. About 1500’.